Which telecom is right for you? It depends. In a tumultuous market, large-cap telecoms are often viewed as a safe haven for investors. The wireless and cable businesses are usually pretty "sticky" due to recurring monthly subscription revenue. In addition, they tend to pay large dividends (which investors like very much!). Often, they are thought of as near-utilities -- a necessary good or service, no matter what the economy is doing. That being said, telecoms are not risk-free. They don't grow particularly fast, and they carry lots of debt. Two the of the largest telecoms are Verizon (NYSE:VZ) and AT&T (NYSE:T). Let's take a look at both companies and see how they stack up for investors right now. Verizon and AT&T both offer wireless and wireline services to consumers and enterprises. Both have tried to expand into media over the past few years. Verizon attempted to get into the online advertising business, buying AOL in 2013 and thenYahoo! in 2016. In contrast, AT&T made larger purchases: DirectTV in 2014, and Time Warner (which owns Warner Bros. Studio, HBO, TNT and other media assets) in June 2018 after a challenge from the government. 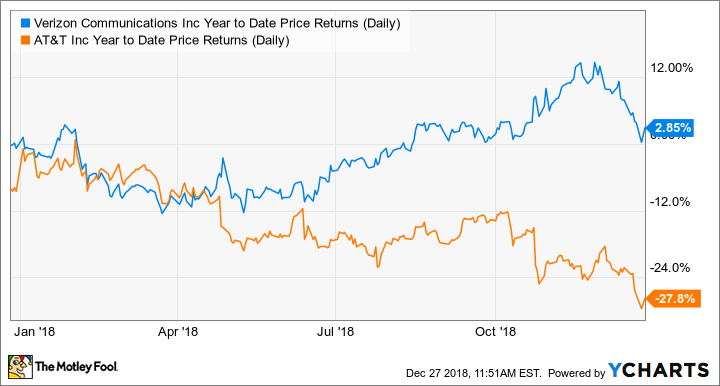 As we found out recently, that media gambit didn't work out so well for Verizon; the company wrote down its digital assets by roughly half in December. AT&T also appears to have misfired with DirectTV, a satellite business that has fallen victim to cord-cutting. Satellite is also competitively disadvantaged versus terrestrial cable these days, making the purchase even worse. That being said, AT&T did acquire lots of customer relationships, and is now pushing ahead with the over-the-top service DirectTV Now. And after acquiring Time Warner last year, the company is about to unveil a three-tiered streaming service. AT&T also acquired Appnexus, which will allow AT&T to use programmatic advertising to better target audiences with ads. So AT&T is becoming much more aggressive on the "bundled" play. Verizon, under new CEO Hans Vestberg, is pulling back to focus on its strengths. Many agree that Verizon has the highest-quality network in the U.S., and the company rolled out its 5G service in four cities this fall. Moreover, the company has leased its network to both Charter and Comcast for their respective wireless services. In today's market, investors clearly prefer Verizon's strategy, and are apparently nervous about AT&T's aggressiveness, most of which which has been fueled by debt. Of course, many investors buy these stocks for stability and dividends. On that front, AT&T's more pronounced sell-off has pushed its dividend yield up to a sky-high 7.3%, versus Verizon's 4.4%. 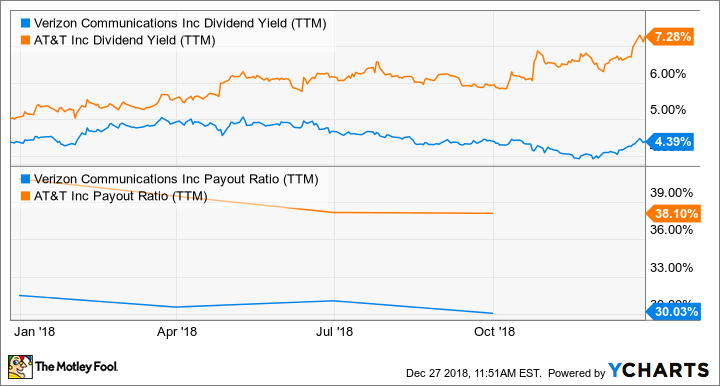 That being said, AT&T's payout ratio, or the amount of net income the company pays out as dividends, is also a bit higher than Verizon's, meaning Verizon's dividend is safer for now given the earnings the company makes. VZ Dividend Yield (TTM) data by YCharts. Another element that makes AT&T more risky is the company's high debt load. AT&T's debt has ballooned to over 3.3 times its EBITDA (earnings before interest, taxes, depreciation, and amortization). That's in contrast to Verizon's mere 2.7 debt-to-EBITDA ratio. 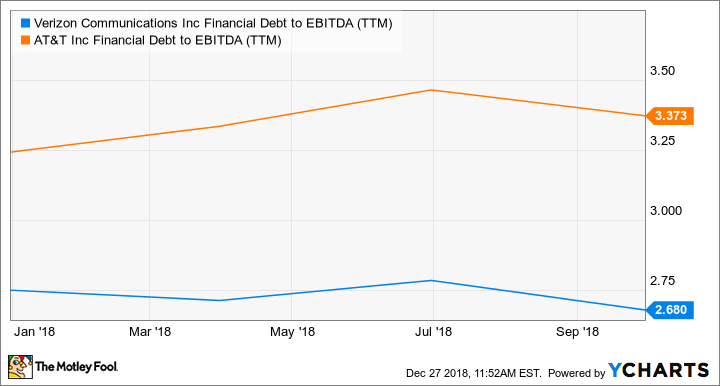 VZ Financial Debt to EBITDA (TTM) data by YCharts. It looks like AT&T is trying to turn itself into a growth company again, with its aggressive purchases fueled by cheap debt. Now that interest rates are set to rise, investors are running for the hills. But if AT&T manages to launch a successful streaming product while also executing on its 5G transition, it could lead to substantial upside for investors. That's a big "if," however. If AT&T fails to lure customers in with its bundling offers, things could get dicey. Verizon, on the other hand, is being a bit more "boring," focusing its strengths and cutting costs, not attempting to become a huge media conglomerate (at least not anymore). That should be the much safer route to go -- but as you can see, Verizon's valuation is higher than AT&T's, so its upside may be limited. Which is the right telecom for you? It depends on your risk tolerance. AT&T offers bigger upside, so for risk-tolerant investors that looks like the better play. But for those investing in telecoms for their safety, stick with Verizon.